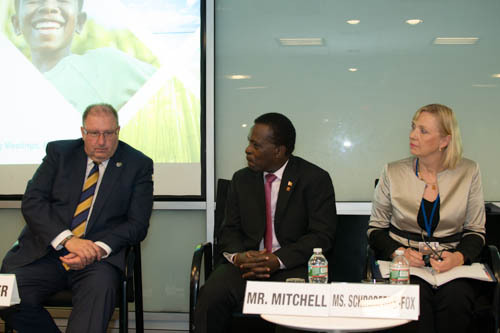 The new chairman of the World Bank’s Small States Forum, Grenada’s Prime Minister Dr Keith Mitchell, believes the time has come for a change in the narrative surrounding the global grouping. In a keynote address in Washington DC last Thursday outlining a new vision for Small States, he told delegates the new narrative must be powered by the distinct advantage of the body. “To deliver concrete results, we need to change the narrative surrounding Small States. We need a new narrative where small size is not seen as a disadvantage, but as a distinct advantage,” said Dr Mitchell. “For example, Singapore, Iceland and Mauritius have already distinguished themselves as small successful economies. We do not come to the table, cap-in-hand. We come with something valuable to offer. Small is nimble …quick ….and cost-effective”. In a comprehensive address, Prime Minister Mitchell listed a number of specifics for Small States, including the Blue Economy, Renewable Energy and Technology. Dr Mitchell noted that small islands can reap the benefits of having as much as 1000 times more space at sea, than they do on land. “In the Pacific they have created ‘the OPEC of Tuna Fisheries’. Moreover, the ‘Pacific Possible’ initiative seeks new opportunities beyond fisheries,” Dr Mitchell pointed out. “In the Caribbean, our coastal resources have become the main engines of our economies. A new World Bank study values the Caribbean Blue Economy at $409 billion”. The new chairman reminded a delegation of top officials that many Small States are saddled with very high energy costs. The Grenadian leader told the meeting that Small States can deliver geothermal energy, solar energy and wind energy at cheaper rates. “Compared to large developed economies, the Caribbean is paying 200% to 500% more for electricity. In remote islands in the Pacific, it can be as high as 1000% more,” Dr Mitchell said. “Small States can set an example for the rest of the world. We can make Renewable Energy the de facto source of energy for ourselves by 2030”.